They are of voting age and angry. Rock the vote or it could be bang-bang-bhangra the vote, if young Indian Americans have their way. 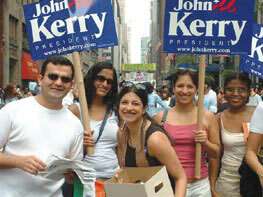 Reshma Saujani and other South Asian supporters canvassing for John Kerry. On a recent evening, down at SOBs in Varick Street in the Village in Manhattan, a crowd of young people had gathered, wildly dancing, their arms flailing in the air, feet moving to the pulsating rhythms of Indian drums. Bhangra Against Bush was the event organized by DJ Rekha in her popular series Basement Bhangra Third Thursdays, and it drew a frenzied lot, quite ready to get the White House vacated. Bye Bye Bush is the cheeky name for a dance benefit organized by Ashu Rai, co-founder of Sholay Productions, an entertainment company that caters largely to the gay and lesbian South Asian community in Tribeca, but also to straight progressive South Asians and non-desis. 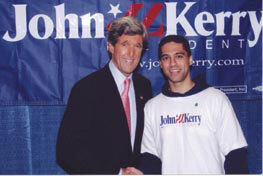 Mekhail Anwar co-founded the Boston chapter of South Asians for Kerry. The event is timed around the time of the Republican National Convention in New York, and is one of the many protests that are planned. New York, of course, wears its liberal heart proudly on its sleeve and has had a strong progressive South Asian presence for many years. 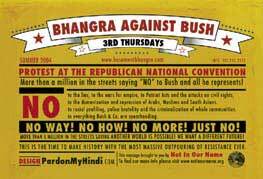 The anti-Bush sentiments are repeated in group after group of young South Asians, especially those that are activist and progressive. Young people are doing just about everything from mass emails and voter registrations to raising a cool million dollars for the Kerry-Edwards campaign. Dino Teppara, senior legislative assistant with U.S. 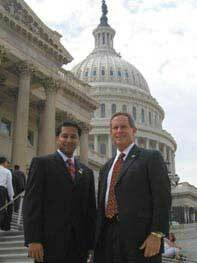 Congressman Joe Wilson, co-chair of the Congressional Caucus on India and Indian Americans. The American-born children of immigrants have come of age and unlike their parents, who seem to live in India in spirit, they feel very much American and relate to the issues here – healthcare, education, immigration and creation of jobs. Many of them have got further politicized by the aftermath of 9/11 when every brown face was looked upon as a potential terrorist. Reshma Saujani, 28, is an attorney in New York who co-founded South Asians for Kerry in February 2003, long before the senator became the front-runner. This specifically is an organization to get John Kerry elected, and branches have been started in Washington, Boston and California, all led by young professionals under the age of 30. The Boston chapter was co-founded by Mikhail Anwar, 26, who is currently doing his Ph.D in electrical engineering at MIT, and Maya Nambisan, who studied public health at Harvard. Rushabh Doshi, who is 28 and works as a strategy consultant, started the Washington, D.C., chapter in January 2004. Saujani believes many of the younger generation got politicized on college campuses so it’s natural for them to remain politically involved when they become professionals. This generation doesn’t stop at photo ops and fundraising, but is actually getting involved at the grassroots level, organizing phone banks, voter registration drives and canvassing with the candidate. 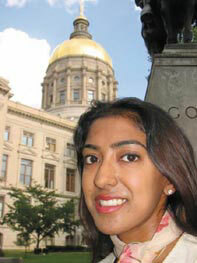 Dhruti Contractor, founder of the Georgia American Political Action Committee. If you look at all the existing political organizations, all of them are Indian American-centered and none of them, I think. are at this point inclusive of all South Asian communities,” says Saujani. In embracing a South Asian identity, would these young professionals have to give up some of the pet issues of the first generation? She says, “I don’t think so. We may have very different views about India and Pakistan and Kashmir and regional issues, but we can still get together in a forum to discuss. The domestic issues – health, education, the fallout from the Patriot Act, the environment – are the ones energizing the young. 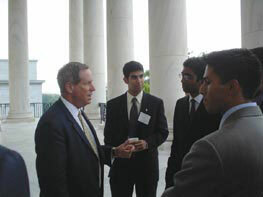 Congressman Joe Wilson with interns from the IACFPA Washington Leadership Program. Left leaning groups like Youth Solidarity Summer (YSS) and DRUM have been started by young South Asians and new ones, all emphasizing issues, are cropping up all the time. The newest is a Jackson Heights based organization, People Against the Draft, which is initiating a series of town hall meetings. Among its founding members are Mona Sehgal, a lawyer, and her husband, activist-writer Jacob Levitz, and the purpose is to protest the possible reinstatement of military conscription. Sehgal, who has a 7-year-old son, says: “As a mother I’ll do everything I can to stop it.” Indeed, as the second generation start families and put down roots, these issues become increasingly important to them. Indian youth, however, are not uniformly Democrat. Young Indian American Republicans, who believe that Bush is the right person to steer the country through difficult times, are also becoming vocal. Ralph Nurnberger, a professor at Georgetown University and a Washington associate of the Indian American Center for Political Awareness (IACFPA) believes that the Indian American community, like any other community, is affiliated with both parties. However, IACFPA’s 1996 survey of Indians found a three to one advantage for Democrats among the Indian community: 42% identified themselves as Democrats; 13% Republican and 30% Independent. The survey also found that nearly 66% of Indian Americans preferred Clinton over Dole, who was preferred by only 9% in the 1996 presidential race. As he points out, all the Indian Americans who get involved in seeking elective office or make politics a career or at least a way station along their career tend to be young. There are now some 40 Indian Americans working in Congressional offices, most under 30 years of age. Narender Reddy, a pioneer fundraiser for the Republican Party in Georgia and a delegate to the Republican National Convention, believes that almost 90 percent of Indian Americans are Democrats, but are slowly moving toward the Republican Party. So is there an anti-Bush bias amongst young South Asians, we asked Dino Teppara, 31, a Republican, who is an attorney and senior legislative assistant to U.S. Congressman Joe Wilson (R-S.C). He believes the core values of Indian Americans, the sanctity of marriage, family and faith, are Republican values. Indians are also a strong business community, so that’s a strong segment that supports the Republicans, who are seen as pro-business, he says. Indeed, there are several names in the Republican Party who are power players, starting with Louisiana’s Bobby Jindal to Ash Jain, who at the age of 33 is the highest-ranking Indian in the State Department. Indian American voters also tend to have an independent streak where they may vote for particular candidates rather than parties and in the absence of current surveys of Indian American voting patterns, one cannot predict the mood of the second-generation voter. But if the 1996 survey from IACFPA is any guide, for the vast majority of young Indian American voters, there’s no beating about the bush – they want a Bush Free White House.